Qualcomm Technologies, Inc., a subsidiary of Qualcomm Incorporated (NASDAQ:QCOM), has introduced the new Qualcomm® Snapdragon™ 845 Mobile Platform. Thoughtfully designed with tech savvy consumers in mind, Snapdragon 845 utilizes Qualcomm Technologies’ industry leading wireless heterogenous compute expertise to design a platform for immersive multimedia experiences including eXtended reality (XR), on-device artificial intelligence (AI), lightning-fast connectivity, and introduces our new secure processing unit (SPU) delivering vault-like security for premium, flagship mobile devices. Immerse: The Snapdragon 845 Mobile Platform was designed for consumers to capture cinema-grade videos and blur the lines between physical and virtual worlds. Snapdragon 845 introduces an integrated Qualcomm Spectra™ 280 image signal processor (ISP) and Qualcomm® Adreno™ 630 visual processing subsystem. These brand-new architectures bring high-performance, true-to-life cinematic video capture, along with superior photography to flagship mobile devices. Snapdragon 845 will be able to captures 64x more high-dynamic range color information for video capture and playback on Ultra HD Premium displays, compared to the previous generation ―a first in the mobile industry.This massive boost in color information includes 10-bit color depth for over one billion shades of colors that can be displayed to the wide Rec. 2020 gamut for amazing 4K/Ultra HD videos so your precious video memories can be viewed with a billion shades of brilliance. In addition to advancing the video capture experience, the new Adreno 630 visual processing subsystem architecture will transform entertainment, education and social interaction, making them more immersive and intuitive. It is designed to deliver innovations for new XR experiences that span virtual, augmented and mixed reality. Snapdragon 845 is the first mobile platform to enable room-scale 6 degrees of freedom (6DoF) with simultaneous localization and mapping (SLAM)―for features such as wall-collision detection. Additionally, Snapdragon 845 introduces “Adreno foveation,” which substantially reduces power consumption, improves visual quality and boosts XR application performance, as compared to the previous generation. AI: Snapdragon 845 is Qualcomm Technologies’ third-generation AI mobile platform, delivering 3x improvement in overall AI performance of the prior generation SoC - transforming your mobile device into the ultimate personal assistant; simplifying how you take pictures and videos; enhancing your VR games, and making voice interaction natural. Snapdragon 845 improves voice-driven smart assistants with improved always-on keyword detection and ultra-low-power voice processing thanks to the performance from the Qualcomm Aqstic™ audio codec (WCD9341) and low-power audio subsystem, so users can interact with their devices using their voice all day. In addition to the existing support for Google’s TensorFlow and Facebook’s Caffe/Caffe2 frameworks, the Snapdragon Neural Processing Engine (NPE) SDK now supports Tensorflow Lite and the new Open Neural Network Exchange (ONNX), making it easy for developers to use their framework of choice, including Caffe2, CNTK and MxNet. Snapdragon 845 also supports Google’s Android NN API. Secure: As security needs evolve, so do the security solutions within our mobile platforms. End-users demand enhanced privacy due to the significant growth of personal data being stored on the device. Similarly, payment companies are looking for more secure authentication mechanisms to increase reliability. The Snapdragon 845 introduces a hardware isolated subsystem called the secure processing unit (SPU), which is designed to add vault-like characteristics to existing layers of Qualcomm Technologies’ mobile security solutions. Doing so makes it possible for improved biometrics security used for authentication, as well as user or application data key management used to encrypt critical information. Connect: The Snapdragon 845 features our most advanced suite of wireless technologies ever in a mobile platform, with cutting edge LTE, Wi-Fi, and Bluetooth features. The Snapdragon 845 integrates Qualcomm Technologies’ second-generation Gigabit LTE solution �C the Snapdragon X20 LTE modem. Its lightning-fast connection speeds allow users to enjoy immersive XR experiences in more places, download a 3GB movie in less than 3 minutes, just before boarding a flight and access large files or apps in the cloud as fast as those stored in their phones’ memory. The Snapdragon X20 modem supports an expanded range of technology and frequency band configurations across licensed, unlicensed and shared radio spectrum �C all designed to accelerate global availability of Gigabit LTE as operators prepare for 5G. The modem supports LTE Category 18 peak download speeds of 1.2 Gbps, up to 5x carrier aggregation, License Assisted Access (LAA), Dual SIM-Dual VoLTE as well as 4x4 MIMO on up to 3 aggregated carriers. Snapdragon 845 also includes diversity-enhanced 60GHz 802.11ad Wi-Fi for more robust multi-gigabit coverage at speeds up to 4.6 Gbps, and integrated 802.11ac Wi-Fi with advanced features that provide up to 16X faster connection setup, simultaneous dual-band support for an ever-expanding set of applications and 30 percent more capacity utilization on carrier Wi-Fi networks, compared to the previous generation. The platform’s proprietary enhancements to Bluetooth 5 allow users to broadcast audio simultaneously to multiple wireless speakers, smartphones or other devices and are designed to reduce battery consumption of wireless earbuds by up to 50 percent compared to the previous generation. Perform: Through heterogenous computing, the Snapdragon 845’s new architectures are being built to transform the user experience while providing significant improvements in performance and battery life. The new camera and visual processing architectures will help Snapdragon 845 deliver up to 30 percent power reduction for video capture, games and XR applications compared to the previous generation. Graphics performance and power efficiencies will also garner up to a 30 percent improvement as a result of the new Adreno 630, compared to the previous generation. The new Qualcomm® Kryo™ 385 architecture, built on Arm® Cortex™ technology, will see up to 25 percent performance uplift across gaming, application launch times, and performance intensive applications compared to the previous generation. The Snapdragon 845 Mobile Platform is currently sampling to customers and is expected to begin shipping in commercial devices in early 2018. Snapdragon 845 will power devices such as smartphones, XR headsets and always connected PCs. 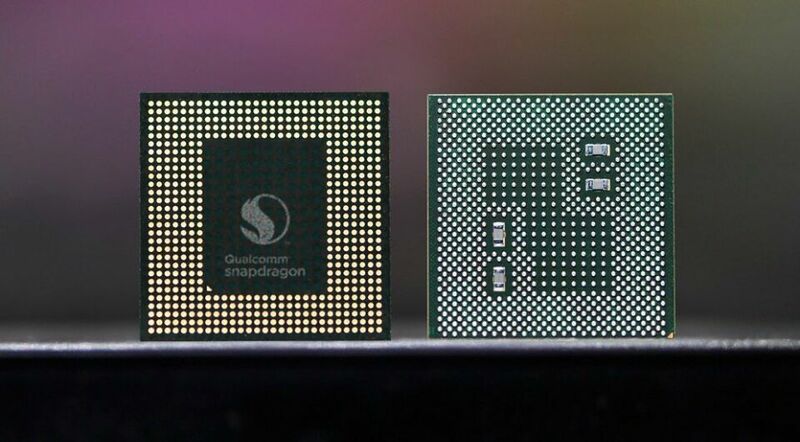 For more information on the Snapdragon 845, please visit Qualcomm’s site atwww.qualcomm.com/snapdragon. Qualcomm’s technologies powered the smartphone revolution and connected billions of people. We pioneered 3G and 4G �C and now we are leading the way to 5G and a new era of intelligent, connected devices. Our products are revolutionizing industries, including automotive, computing, IoT, healthcare and data center, and are allowing millions of devices to connect with each other in ways never before imagined. Qualcomm Incorporated includes our licensing business, QTL, and the vast majority of our patent portfolio. Qualcomm Technologies, Inc., a subsidiary of Qualcomm Incorporated, operates, along with its subsidiaries, all of our engineering, research and development functions, and all of our products and services businesses, including, our QCT semiconductor business. For more information, visit Qualcomm’s website, OnQ blog,Twitter and Facebook pages.